Direct Sellers - does this sound like you? You are ready to step things up & experience more joy in your life & business this year. You are seeking more balance & organization for all the tasks and responsibilities of your business (and life). You want to learn how to create simple, effective systems that save you time and give you more results. You believe that your life & business has a bigger purpose but are struggling to find the confidence & clarity to reach it. You wish you had more time in the day to do everything you need to do & also enjoy life's moments more. You are tired of burning your candle at both ends & feeling like you have to be 24/7 to run a successful business. You would love to have a step by step plan for working your business, balancing your life and reaching your goals. You feel like one of the biggest obstacles to your success is a lack of consistency & are ready to change that. You would love to have support, accountability & encouragement as you work to create a plan for your best year yet. If you are saying YESSS!! 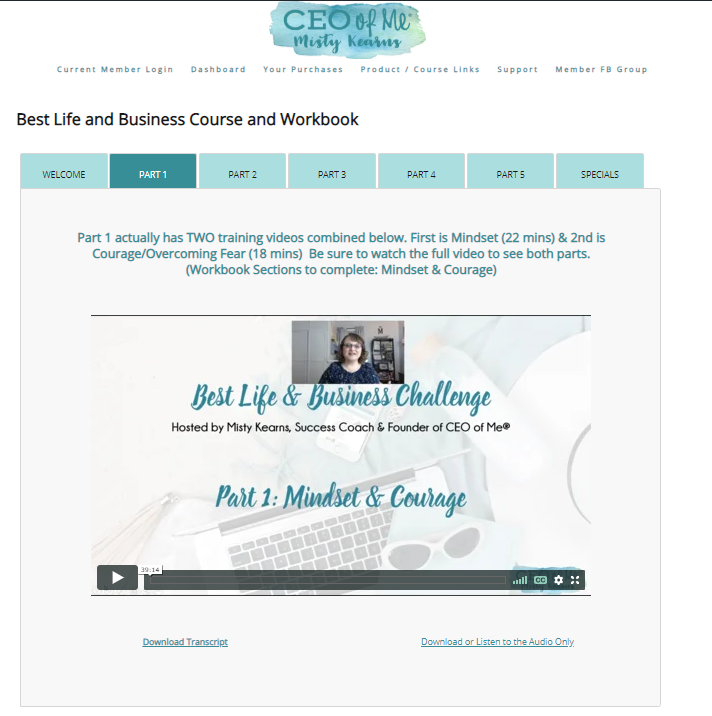 !, then the CEO of Me Best Life & Biz Course & Workbook is here to help you shift your life & business to one that is thriving, confident & organized! The training, tools, strategies & worksheets with this 5 part course & workbook will help you get clarity on what's working, what's missing & what is truly your definition of success and the best life & business you want. Through the training & tools, you will be able to create a simple plan to help you take the next best step forward in your life & business while helping you create a solid plan for 2019 & beyond! Misty Kearns, Certified High Performance Coach & Founder of CEO of Me. As a former top leader in the Direct Sales industry, successful entrepreneur & a Certified Coach, I help direct sellers step into their most confident & authentic self, increase their productivity & consistency & become heart-centered marketers so they can step into the role of a CEO of Me & create their best life & business! I'm excited to share this powerful training and workbook full of strategies, systems, thought provoking questions, planning pages and action steps to help YOU make this YOUR best year yet! This 50+ page printable workbook includes thought provoking questions to guide you to setting priorities, overcoming blocks, creating your business vision & forming actionable goals for 2019 PLUS planning worksheets and templates for your direct sales business. 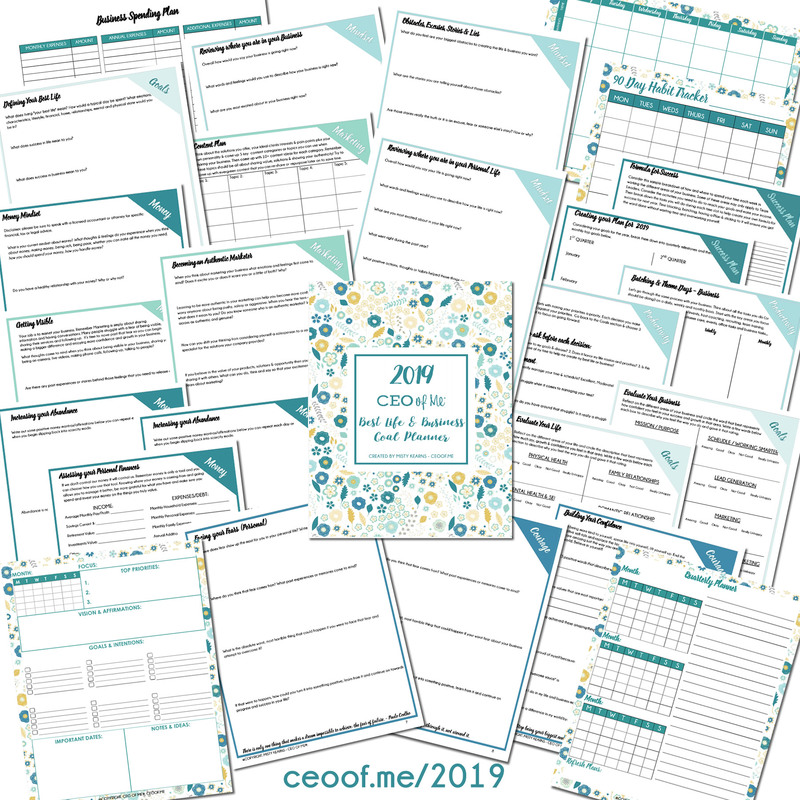 *Updated for 2019 with new worksheets & tools! It's time to create YOUR Best Life & Business! Want to get a sample of the training first? Enter Your Info Below for Immediate Access to Part 1 of the Course for FREE! "Going through the training and the workbook has helped give me a better focus for this year and be more aligned with my priorities. I feel much more confident about moving forward in my business and I have seen many positive results from using what I learned in my everyday life to create a better schedule and get more done." "I've learned how our personal lives and our mindset affects what we do in our business. I never realized how so many of my fears were simply old stories from my past that were affecting my confidence in sharing my business. I feel so much more confident now after learning more about how to share my business, how to connect with my goals and simply be my best self." "I actually have a step by step plan for working my business now that I feel I can easily follow and achieve my goals. I feel more excited about my business than ever before. Thank you for this course & challenge!" This workbook is GOLD, pure gold! I have been through a lot of business training but this is the only one that really connects all the dots and helps you see and understand what your struggles and your strengths are and how to overcome what is holding you back so you can truly step into your best self. I am encouraging everyone on my team to take this course and do the workbook because I know it will change everything for them too." 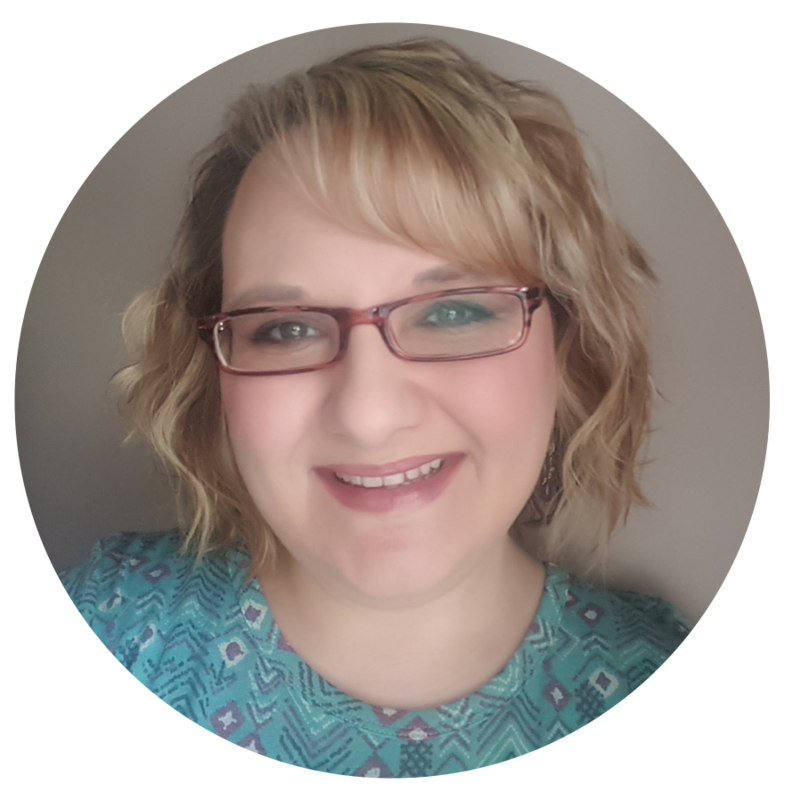 "I wanted to reach out & let you know that I absolutely LOVE your coaching style and how authentic you are. You have helped me really see what is important in my life and how I can work my business around that and still be successful without being overworked or overwhelmed. This course was so easy to work though and the planning pages in the workbook are helping me take what I have learned and actually put it into practice in my life and my business." "I have attended a lot of training but this has been the absolute best one yet! I had my team sign up so we could go through it together and be ready to all go into the new year with a solid plan for success. I love the workbook and bonus planning pages too!" "Thank you so much for this training, this is the first time I have ever really set goals and taken the time to think about what is really important in my life so I can build my business around it." "I started on the worksheets and the questions led me to the areas I need better focus. I feel totally ready to rock my business next year now! Thank you! "I loved the questions (in the workbook). As you fill them out you know what you're doing and why you're answering them, but then all of a sudden it all comes together and that was amazing for me." "I am totally blown away from the training and workbook you have provided in this program. It has opened my eyes up to so many areas that I am now working on overcoming and developing better habits and thought processes on. I am more pumped for the new year than ever and cannot wait to put my goals into action. I especially love the monthly goal breakdown worksheets. Thank you so much for offering this!" "I don't know how your training post ended up in my Facebook news feed but I am SO glad it did! This training has totally changed how I think about my business and helped me realize what success and happiness really mean to me. I feel like I can take the plans I have made through this challenge and actually achieve them. Thank you so much for offering all of this!" "I have continued to use the tools, training and worksheets from last year's course throughout this year to help me continue to stay on track to reaching my goals and it has made such a difference and been a huge help! I can't wait to go through it again each year!" & Founder of CEO of Me. I'm an introvert from a small town in NC who has always done things a little differently than others. I started my direct sales journey in 2006 by joining a few companies just for the discount with no intention of building a business. I did not think I could be successful in sales much less as a leader because of being an introvert, super self-conscious and lacking confidence. I really thought I would just be a happy "kitnapper" and enjoy getting my products at a discount for a while. A few months later, I was fired from my full time job. I was single, 25 years old living on my own with no money in savings. I quickly piled up massive debt using credit cards to pay bills and fell into a depression. I knew I wanted more for my life but had no idea direct sales could open up the door to so many possibilities. I decided to dive into the business & give it a try until I figured out what I was going to do. 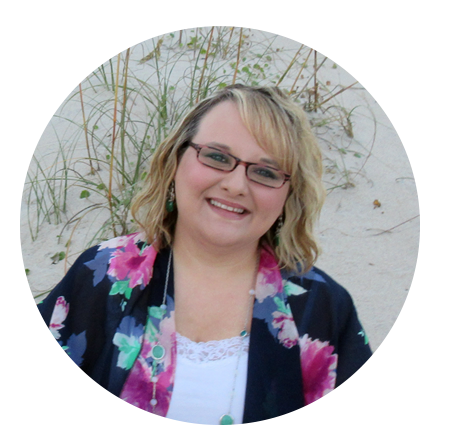 I realized that direct sales was a great fit for me & I was able to replace my full time income in less than 6 months! I quickly moved up the ranks in my company & consistently placed in the Top 20 Directors for my Region & in the US. Direct sales offers so many rewards beyond income & recognition. While I have earned free trips, the keys & title to my own convertible & more prizes than I can remember, gaining self worth & confidence and being able to live life on my terms has been life-changing! The best rewards have been the friendships I have gained & getting to help others reach their potential. My true passion is empowering & teaching others how to connect with their own personal definition of success and create goals that help them live their own best life & business. In 2011 while leading my amazing team & enjoying living the "CEO of Me" lifestyle, I started a blog named "CEO of Me" to start sharing my tips and methods. This led me to being asked to sell my printable tools and do speaking engagements. In 2015 felt led to leave my direct sales career and become a Coach full time so I could help other direct sales professionals reach their goals and dreams too. I have the experience, training and skills to help teach you the strategies, systems & tools to success. Most of all, I have a heart and passion to empower and inspire you to stop playing small and start living the life you were created to live. I believe the essential keys to success in business & life come from our beliefs about ourselves (confidence), working smarter & implementing systems (productivity), how we share our solutions & serve others (authenticity) & by spending our time working on the things that get the most results in the least amount of time in the easiest way possible (consistency). 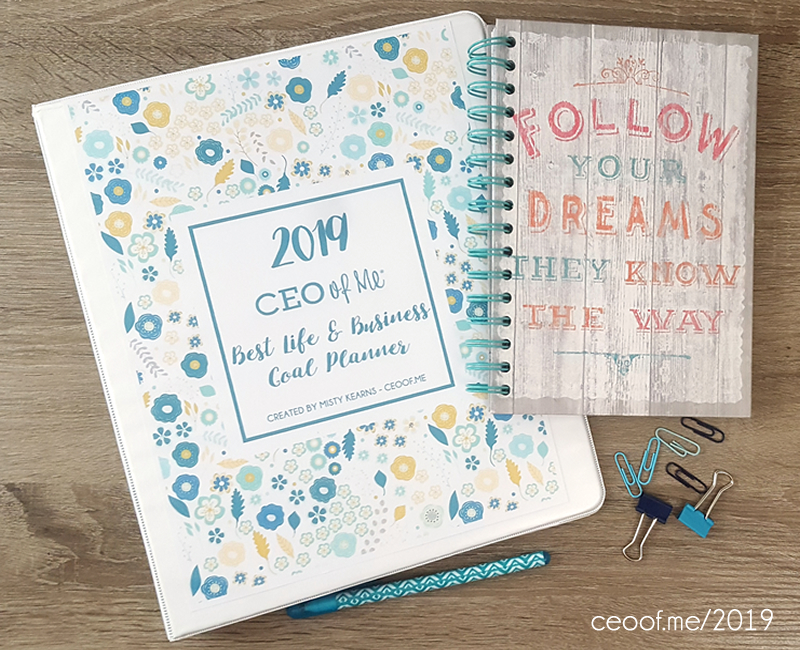 I hope you'll sign up for my FREE 2019 Planathon and join us during December to plan your amazing 2019 so you can begin living your own CEO of Me life too!